More civilians have already fled Mosul than left eastern Aleppo during its liberation, Russian Foreign Minister Sergey Lavrov has said, commenting on the humanitarian situation in Iraq’s second largest city. “Those who have seen pictures from Mosul cannot help feeling anxiety… More civilians have definitely fled from there than left Aleppo during its liberation,” he said. 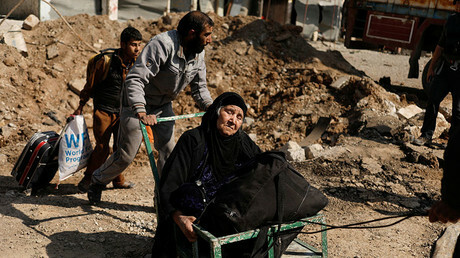 The Syrian military liberated the Syrian city from terrorists late last year with the backing of the Russian Air Force. “When covering the situation in Mosul and other parts of the region where the operations are carried out by members of the anti-terrorism coalition… the journalists should feel responsible for their professional duties,” Lavrov stressed. Allegations that the Western media is down playing the situation in Mosul were leveled earlier this week by the London-based monitoring group, Airwars. “Since the assault, first on east Mosul and then west Mosul began, we have seen just a remarkable change at Mosul, moving from tens of civilians reported killed every week or even every month, to hundreds reported killed every week now by coalition airstrikes,” Airwars director Chris Woods told RT’s Ruptly video agency. According to Woods, the number of civilian casualties reported in Mosul exceeds those from Aleppo. “We’re seeing worse numbers now in Mosul than we did during Aleppo. There was a report in the British Daily Telegraph over the weekend saying 300 civilians died in just two neighborhoods of Mosul in a 24 hour period as a result of airstrikes,” he said. The mainstream media extensively covered the Aleppo operation, while constantly accusing Damascus and Moscow of killing civilians and committing war crimes. Yet, when it comes to Mosul, Wood says the international media has remained largely silent. “We didn’t see that level of death in Aleppo, yet we did during the final stages of Aleppo – in fact all through the Aleppo siege – we saw significant international media coverage. So why is there this difference? Why does international media not want to engage on civilian casualties in Mosul?” he asked. Woods said reports coming in on a daily basis show that the number of civilian casualties is dramatically growing, though he noted that the group has been unable to verify all of the cases, as there are too many. Iraqi troops, backed by Kurdish Peshmerga forces, Shiite militias, and the US-led coalition, launched an operation to free Mosul from Islamic State (IS, formerly ISIS/ISIL) in October. The eastern half was liberated in January, and operations to free the western side are now in full swing. With so many residents already lacking food, water, and electricity due to the fighting, the new drive has wrought great damage on the city’s infrastructure and led to a humanitarian crisis. 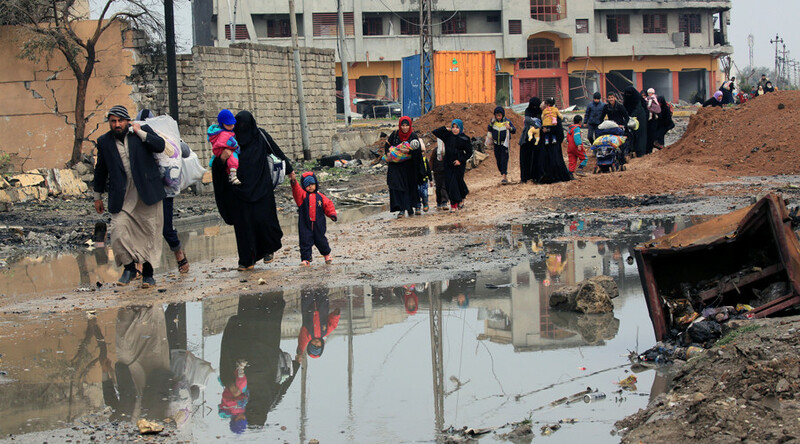 Over 200,000 of the over 750,000 civilians who lived in western Mosul before the assault have fled over the past few months and that number is growing rapidly, according to the International Organization for Migration. RT visited one of the refugee camps being built outside the city to accommodate internally displaced persons (IDPs) last week and spoke to a builder named Mohamed Nazir, who said the number of refugees has been growing daily. “There is no water, no food, no bread. Nothing,” one displaced man from Mosul told RT at the new Hamam Alil 2 camp. “We left our house, our cars, everything we owned, we took nothing but our clothes. We are scared, tired and hungry. My situation speaks for itself,” another added. 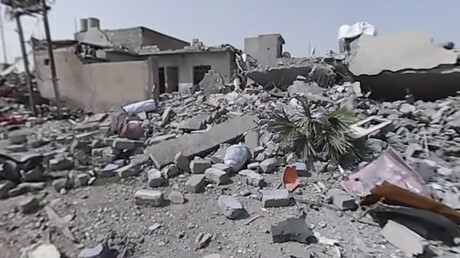 Mosul refugees have also criticized the US-led coalition’s airstrikes, claiming they often hit civilian infrastructure rather than Islamic State targets, despite its claims that every precaution is being taken to assure civilians are not harmed in its attacks. “[IS] go on the rooftops of the houses and the families don’t know, then the aircraft come and bomb it,” Mosul resident Ibrahim Rfaee told Ruptly. “We are asking for bombing specific targets. There are still families inside the houses and the aircraft keep bombing. We are asking the coalition planes to be specific when they bomb. They were bombing randomly,” he said. “They dropped leaflets over the city telling us not to worry about the strikes, saying that they were extremely precise and would not hurt the civilians,” said Yusuf Ahmed, who lost his brother to a coalition airstrike. “Now it feels like the coalition is killing more people than [IS],” he said. The UN estimates that 5,000 people have been fleeing the city on average every day since the siege intensified last month. Lise Grande, the UN’s humanitarian coordinator for Iraq, predicted in late February that the US-backed offensive in western Mosul could displace up to 400,000 civilians. UNICEF’s regional emergency coordinator in Iraq, Bastien Vigneau, later gave a similar estimate. “We believe there are around 750,000 people, with more than 300,000 children [among them], inside west Mosul, and we believe half of that number of people would flee,” he told RT last month.